Volume or weight units - which are better? 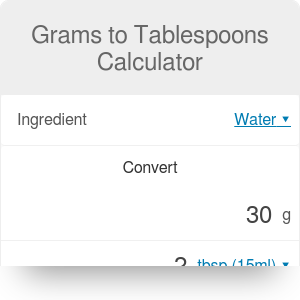 If you're struggling with grams and tbsp conversion, look no further - this grams to tablespoons calculator has everything you could ever need when dealing with simple cooking measurements. We don't always have a kitchen scale close at hand (or it's not accurate enough when dealing with small weights, or we're just too lazy to use it), so volume units are preferable, especially for liquids. Scroll down, and you'll find out not only how to convert flour tablespoons to grams, but also how many calories are in 1 tbsp of butter or maple syrup. Change the butter tablespoon to grams. Select the ingredient from a drop-down list. Let's pick olive oil - choose oil from the list, and then a second box appears; this is where you can select olive oil. Enter the amount of product. Assume we want to use the grams to tablespoons calculator the other way round - we have three tablespoons of olive oil, and we'd like to know how much it approximately weights. Type 3 into tbsp box. Here you go! Now we know that three tablespoons of olive oil weighs around 41 grams. Remember that the result is an approximation, as the products differ between manufacturers, and a tablespoon of dry product can be heaped so the volume can vary a lot. The conversions above are related to US tablespoons and US cups. To make it more complicated, different types of cups exist, like, e.g. US legal cup or a metric cup. If you want to read more about these units, make sure to have a look at our grams to cups tool. Some ingredients are much more likely to be expressed in tablespoon unit than the others. Usually, the products which are a small addition to the dish, or may be eaten alone, appear in tablespoons. You'll often find salt or Nutella in tablespoons than e.g. milk or flour (though it's still possible, so we have that option in the calculator as well). Thanks to this short list, you can now choose wisely what to have for your breakfast! If you're looking for good ways of burning extra calories after eating a tablespoon of Nutella (or three), check our calories burned calculator. Also, a calorie calculator may help determine how many calories you should eat a day. In our everyday cooking or baking experience 🍰, we usually use a mixture of volume and weight units. In most cases, dry products appear in recipes in grams, ounces or pounds, whereas liquids like water or milk are measured in cups, milliliters, or tablespoons. However, professional chefs recommend using weight units over volume, as it's a more accurate and reproducible method. Eventually, cooking is all about chemistry. For example, the volume of flour in a cup depends on many various factors - if you spooned the flour, dipped the cup into it, level off or scraping the top off, the amount of flour will be different, although you used the same container. Another perfect example is salt - the tablespoon of the granular form may weight as much as even two tablespoons of flake salt! It's not the issue if you're using a kitchen scale, as weight is a direct measure of an ingredient. But don't worry too much! Unless you're aspiring to be a master chef or you're cooking in bulk - just relax and use this grams to tablespoons calculator. Enjoy the cooking and baking by choosing the units that are most natural and convenient to you - in most cases, you won't notice the difference. Grams to Tablespoons Calculator can be embedded on your website to enrich the content you wrote and make it easier for your visitors to understand your message.